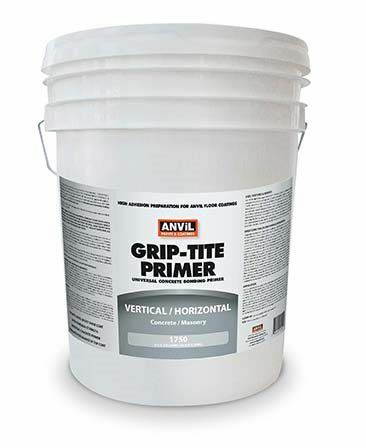 Anvil manufactures a complete line of technologically advanced primers that help solve adhesion problems and make the top coat look and last longer. One great examples of this advanced formulation chemistry is noteworthy in Grip-Tite High Adhesion Bonding Primer for concrete. 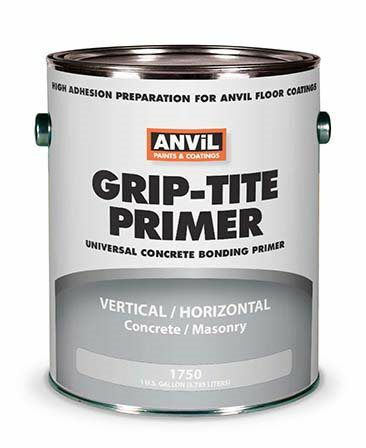 Anvil 1750 Grip-tite forms a surface that improves the workability and durability of the stain topcoat. This interior/exterior water borne primer applied directly to clean, porous concrete overcomes the problem of improperly prepared surfaces. Anvil 1750 can be used on vertical concrete, masonry and stucco. -Etching solution used to clean and de-grease bare concrete surfaces to improve penetration and adhesion of paint, stains, and sealants. 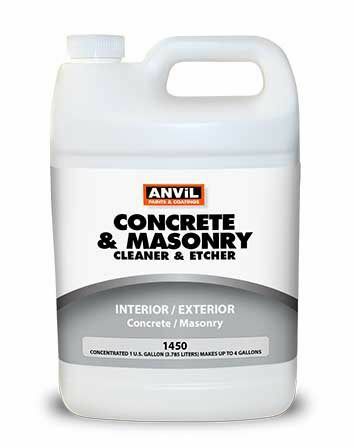 -Neutralizes new concrete and removes light rust stains from concrete, steel, and other masonry surfaces. -Use on interior/exterior uncoated surfaces such as garage floors, driveways, patios, carports, basement floors, and concrete walls. -Removes grease, oil, auto fluids, rust and dirt. It is biodegradable and safe to use near grass and plants. -Do not use on marble, granite, terrazzo, colored concrete, brass bronze or copper. -Clear acrylic sealer to be used as a binder over previously painted chalky and weathered masonry surfaces. -May be used as a primer for bare concrete or stucco walls. 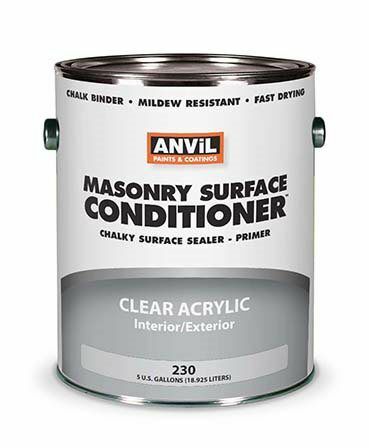 Anacrylic sealer to be used as a binder over previously painted chalky and weathered masonry surfaces. May be used as a primer for bare concrete or stucco walls. Applied directly to clean porous concrete overcomes the problem of improperly prepared surfaces prior to painting or staining. Penetrates into the concrete and improves the adhesion of the topcoat. Forms a surface that improves the workability and durability of the topcoat. 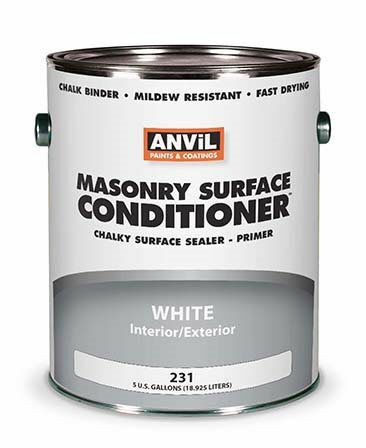 A specially formulated bonding primer that can be used to improve the bonding whenever a masonry type coating, such as Anvil # 1700 High Performance Epoxy Show Coat Concrete & Garage Floor Paint, Anvil #1500 Water Reducible Acrylic Solid Color Concrete Stain or Anvil #2300 Semi-Transparent Concrete Stain is to be applied. Can be used interior/exterior, painted or unpainted, vertical/horizontal concrete, masonry, stucco, CMU block and porous brick surfaces. Also great for use as a touch up primer where other surface coatings have failed. Do not use on wood, metal, epoxy/urethane or silicone treated surfaces. Use on steel, slate, aluminum, wood, galvanized and other non-porous surfaces. 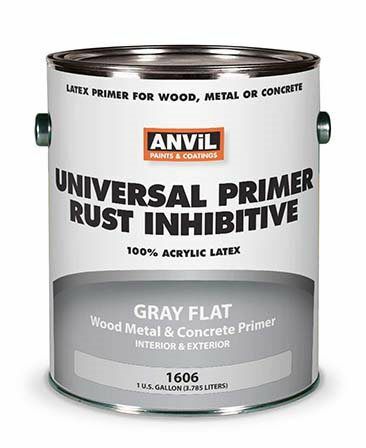 Use as a rust inhibitive primer. Use over spalled reinforced concrete where re-bar is showing. Prevents sap staining of unprimed wood, and water stains in ceiling panels.
. New regional Volatile Organic Content (VOC) regulations (SCAQMD) differ from the U.S. Environmental Protection Agency (USEPA AIM) national standards, this product can not be sold or shipped to the following area: the greater Los Angels basin. 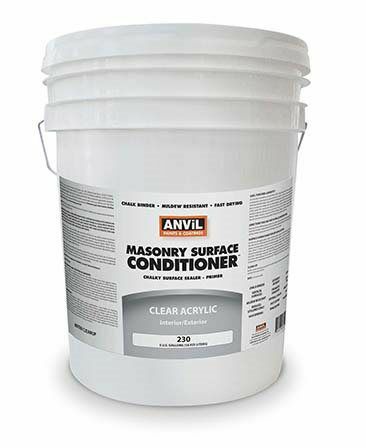 Anvil #230 Clear Acrylic Chalky Surface Conditioner is a clear acrylic sealer to be used as a binder over previously painted chalky and weathered masonry surfaces. 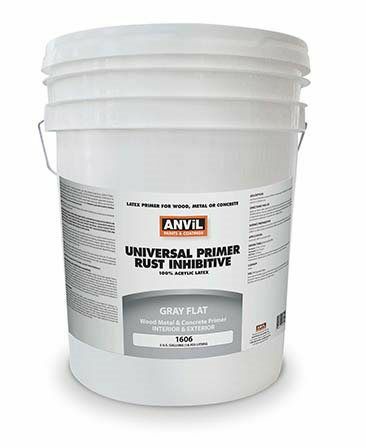 Anvil #230 Clear Acrylic Chalky Surface Conditioner, also, may be used as a primer for bare concrete or stucco walls. An acrylic sealer to be used as a binder over previously painted chalky and weathered masonry surfaces.